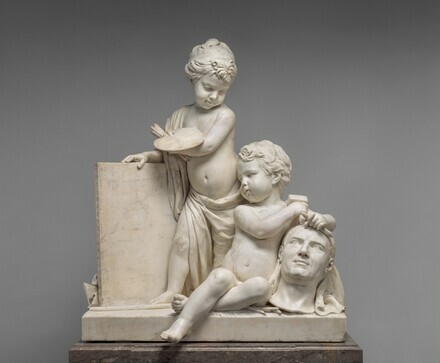  The early provenance is discussed in detail in Ulrich Middeldorf, Sculptures from the Samuel H. Kress Collection: European Schools XIV-XIX Century, London, 1976: 104-106, no. 1673, entry by Charles Avery. Duveen Brothers Records, accession number 960015, Research Library, Getty Research Institute, Los Angeles: Series II.A, Files regarding works of art: reel 148, box 293, folder 4, Tassaert, Marble Group, David-Weill Collection; Series II.I, Collectors’ files, reel 297, box 442, folder 2, Pierre David-Weill; copies in NGA curatorial files).The Duveen bill of sale to the Kress Foundation is dated 28 June 1949; copy in NGA curatorial files. 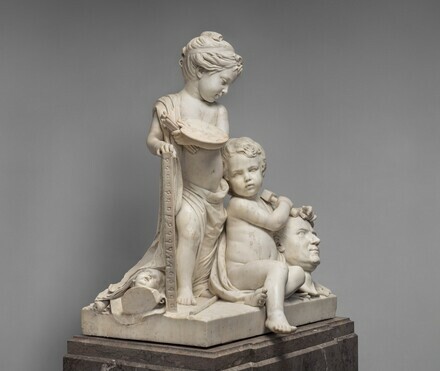 French XVIIIth Century Sculpture formerly of The David-Weill Collection, Wildenstein & Co., New York, 1940, no. 24. Henrist, Gabriel. "La Collection David-Weill." L'Amour de l'Art (1925): 14. Devigne, Marguerite. Laurent Delvaux et ses élèves. (Series: Acade´mie royale de Belgique. Classes des beaux-arts. Me´moires. Collection in-4, 2. se´r., vol. II). Brussels, 1928: pl. 1, fig. 3. Paintings and Sculpture from the Kress Collection Acquired by the Samuel H. Kress Foundation 1945-1951. Introduction by John Walker, text by William E. Suida. National Gallery of Art, Washington, 1951: 262, no. 118, repro. Paintings and Sculpture from the Samuel H. Kress Collection. National Gallery of Art, Washington, 1959: 453, repro. Summary Catalogue of European Paintings and Sculpture. National Gallery of Art, Washington, 1965: 172. European Paintings and Sculpture, Illustrations. National Gallery of Art, Washington, 1968: 151, repro. Kalnein, Wend Graf, and Michael Levey. Art and Architecture of the Eighteenth Century in France. Harmondsworth, 1972: 100. Walker, John. National Gallery of Art, Washington. Rev. ed. New York, 1984: 643, no. 1012, repro. Scherf, Guilhem. "Un Buste de l'Abbé Raynal à l'Académie de Lyon." Bulletin des Musées et Monuments Lyonnais 1 (1988): 17, repro. fig. 9. Poulet, Anne L., and Guilhem Scherf. Clodion: 1738-1814. Exh. cat. Musée du Louvre, Paris, 1992: 307, repro fig. 154. Bailey, Colin. "Mécénat privé? Mécénat public? L'abbé Terray, collectionneur de sculptures contemporaines." In Clodion et la sculpture française de la fin du XVIIIe siècle. Actes du colloque organisé au musée du Louvre par le service culturel les 20 et 21 mars 1992. Paris, 1993: 202-203, fig. 7. Sculpture: An Illustrated Catalogue. National Gallery of Art, Washington, 1994: 224, repro. The Arts of France from François Ier to Napoléon Ier. A Centennial Celebration of Wildenstein's Presence in New York. Exh. cat. Wildenstein & Co., Inc., New York, 2005: 80 (not in the exhibition).